Mine is a 2004 CL500 and the sensor connector is not even close to where it shows in this thread. Well, that makes sense considering it is a different car... try searching the CL forums for this. Is what is needed for my 744-Briliant Silver drivers door? Thanks, I can't wait to fix this. That's about how much mine was... just make sure you're getting the right side (driver vs. passenger). I'm assuming left = drivers, correct? FYI... the torx screw is a T15. My passenger side stopped unlocking keylessly. If I open any other door, it then unlocks the passenger front and I can open it. Would this be the lock module of the handle switch? Anyone know? I purchased the entire handle assembly from an 04' E55 (matching color and door), but if I can get away with just replacing the lock module, that would be cool since I wouldn't have to pull the door panel off. In any case, do they separate easily? That handle looks like one big piece, but I know it HAS to come apart to install the whole thing. I'm hoping I can just remove the lock portion. And how can the bolt be T15 OR T20? I need to buy a lonbger one so I'd like to know which one it actually is. BTW -> the key portion of the lock is irrelevant. That doesn't come out when you replace the handle anyway. The keyless handles are one of the worst parts on this car. I've replaced 3 already, and am about to do a 4th one..... in a little over 2 years of ownership. Go back and re-read the original post. The door panel doesn't even need to come off. This is quite literally 1 screw and one electrical connector......10 minutes tops if you are nervous and working slowly. That is why I'm slightly confused by the DIY. It seems I'll HAVE to take the bottom of this assembly off. Bottom pic.... remove that torx screw on the far left side. The back portion will come apart from the front handle that you need. The handle has a kind of "hook" that allows it to stay in position near it's hingepoint, so once you take out the screw you will need to shift the handle maybe 1/4" sideways before it will release from that large back bracket. THANK YOU Greg. I really appreciate the help! Circling back to this...finally got the rear driver's side handle changed out. Used a T20 in the back as it required a LOT more torque to break loose the screw (which by the way, CAN fall off into the door panel if you aren't careful). The diameter on the rear screw is large and it had blue loctite on it. Connector for the electrical assembly can pivot back, just fyi. Was the rear handles easy to swap out? Do you just need the T20 tool? 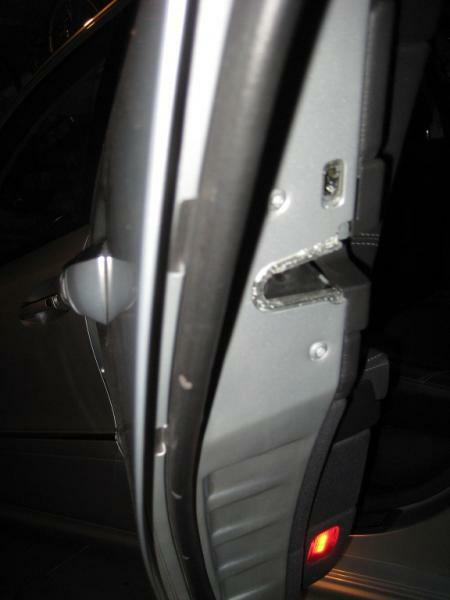 I have a bad driver's side rear door handle that isn't working to lock/unlock on my E55 with Keyless Go. 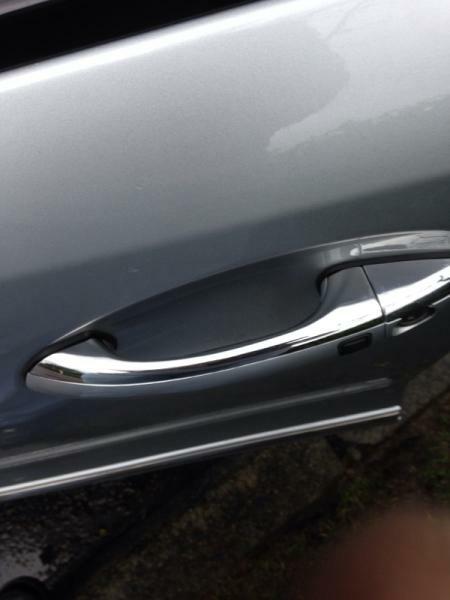 To remove the rear door handle, how is this done? Unlike the front door, which seems pretty easy to do due to ease of T20 Torx access, the rear door handle is placed more anterior towards the front of the car and the access to the T20 Torx that holds it is not very apparent. Does that black cap for the rear latch (first pic) need to be removed to allow for access? 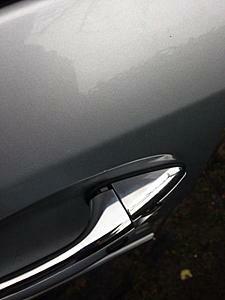 Here's some pics of the rear door to help if someone can point me in the right direction. Any help would be appreciated. Did some searching on the general W211 section and I found this PDF on the outer rear door handle removal and install. It seems easy enough once you remove the door weatherstrip to expose the access hole. 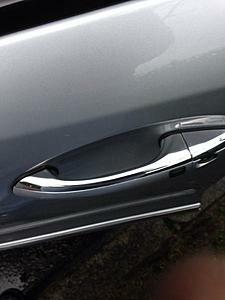 Regardless, any pointers from those who have worked on the rear door handle removal? Will tackle this weekend. Ok so I just replaced my door handle.. Everything works as intended. One issue.. My handle will not seat properly... I've take it out and made sure it was in correctly... It looks ok to me...am I missing something? Got it, it wasn't in correctly. There is a lever inside that the bottom part of the "L" has to go on for it to fit and operate properly.. There are 2-3 of these levers it seems like that the "L" has to seat into. It's good now. Step. 1. Nothing to add. Step 2. When starting to unscrew the T20 screw, it will take some initial torque to get it loose as there is Loctite on it. Unscrew it about 2 full turns—don’t loosen more than necessary. Once you are free of the Loctite, the screw loosens quite a bit and the door handle cover will be able to wiggle. Stop there before the screw can come out of the copper sleeve and fallout. See attached pic. You don’t need to keep the T20 screwdriver in place, but I wouldn’t remove it until you can wiggle the door handle cover a decent amount. Step. 3. To remove the door handle cover, while pulling the door handle outwards, slide the door handle cover towards the back of the car to allow the L-hooks to clear the door frame (see pic; near the yellow marked pieces). This step was trickier than necessary. Step 4. 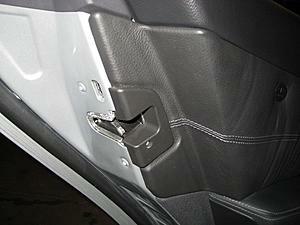 Once your remove the door handle cover, just slide the whole door handle back towards the rear of the car. It will release the L-catches so you slide out the door handle. 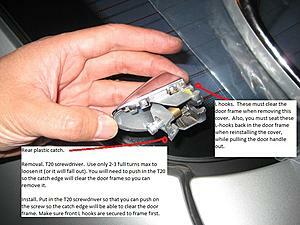 Take off the front rubber gasket (it will allow for easier access to the wiring harness). Step. 5. Pull the door handle out slowly and it will expose the electrical harness. The harness is permanently attached to the door frame via a rotating link. Instead of pointing towards the front of the car, rotate the whole harness 90 degrees so that it points directly at you (perpendicular to the side of the car) for easier harness access. Use a small flathead or needlenose pliers to help facilitate this. Just push the side tab on the harness and it will allow the door handle electrical connector to easily slide out. Reverse the factory instructions. Note: If you removed the front gasket, transfer it to the new door handle so you have it when you replace the harness. By far the only issue I had with the installation was trying to get the door handle cover back on. First, seat the door handle back in the door frame—basically get it in the door holes,make sure it’s flush/flat, then slide the whole handle forward to lock it in place. Put your T20 screwdriver back in the door frame and so it barely shows on the rear plastic guide of the exposed rear door handle hole. Now pull the door handle outwards (like you are opening your car door), and then get the L-hooks on the door handle cover (marked in yellow in the pic) to seat the door frame guides. As you let the door handle close, the door handle cover will be flush in front—at this time, you’ll need to use your T20 screwdriver to push the screw connected piece of plastic catch forward so the plastic edge can clear the mount on the door frame. You will notice a 3-4 mm gap near the back of the door handle cover, push with your T20 screwdriver and then tighten up the screw, it will close the gap and you’ll be done. Do note that the front and rear door handles have different catches. The rear door handle has an extra "L" catch towards the rear, while the front door does not and is shorter (just as the CLS owner mentioned; also do a search on eBay as well for pics of the W211 front and rear door handles). While the rear door handle MAY work for the front door handle, the front door definitely is NOT compatible with the rear door. Either way, I would order the correct part so you don't have issues. Last edited by amg_w211; 03-09-2014 at 11:52 PM. I wish there was a way to just open these stupid things up and figure out why they keep breaking... clearly a design flaw.